Leagues of Gothic Horror takes Triple Ace Games’ roleplaying game of globetrotting adventure and mystery, Leagues of Adventure: A Rip-Roaring Setting of Exploration and Derring Do into that melodramatic genre full of legends, ghosts, vampires, dark magic, great evils, sinister villains, and even romance—gothic horror! That supplement is further supported by a number of smaller books, each of which explores various aspects of the gothic horror genre in greater in order to bring them to life. The Guide to Apparitions is one such volume, expanding upon the information upon things that go bump in the night—and more! And just like other titles in the series, the fact that it is written for use with the Ubiquity roleplaying system means that its contents works with other roleplaying games and settings which use those mechanics, such as Exile Game Studio’s Hollow Earth Expeditions and Clockwork Publishing’s Space: 1889. The Guide to Apparitions has a lot to get through in its sixty-four pages. This includes the infernal origins of ghosts and their history, the creation, motivations, and lairs of ghosts, the diabolical and other powers of ghosts, and ghosts and apparitions of all shapes and sizes, right up to true villains. This includes some thirty-four ghostly powers, thirty-one sample ghosts, thirteen unique apparitions, two new occult tomes, and one new ritual. All together it gives the Game Master the means to create and modify a veritable host of ghosts with which to do the frighteners on the players and their characters. The supplement sets off at a canter with a race through the history of ghosts and apparitions that runs from prehistory and the dawn of civilisation up the modern day—by which the author means the 1890s or ‘mauve decade’ of the Victorian Era. This very quickly highlights the widespread acceptance of the Christian interpretation of ghosts, though other faiths are not ignored. Of course, in the setting of Leagues of Adventure there are clubs galore, each devoted to a particular fascination and when it comes to hauntings and apparitions, there is the Ghost Club. Its studies have formulated and categorised numerous types of ghosts and their means of creation and motivation, and their physical nature, fetters, triggers, and so on. Naturally, these categories are how the supplement classifies its ghosts, so the Guide to Apparitions is both a sourcebook for the Game Master and a reference manual of sorts for members of the Ghost Club. (That said, the Game Master should be careful in what he lets his players read). These motivations include being cursed—either for their wickedness or the wickedness of another, being driven or duty bound to fulfil a task, or seeking justice or revenge. Such motivations differ from Motivations—that is, what drives a player character and earns them Style Points, including player character ghosts. Although NPC ghosts do not earn Style Points, they do actually possess a Motivation, which is the same for all ghosts and that is, Duty. This Duty is acting in accordance with their motivation, so the Duty of a vengeance-born ghost is carrying out that revenge, whilst a Driven ghost is forced to recreate its actions again and again. Their physical nature is essentially how corporeal they are; a fetter is what ties a ghost to the mortal world and can be a place, a person, or a possession; and triggers are set a ghost to act, usually a time or an event. 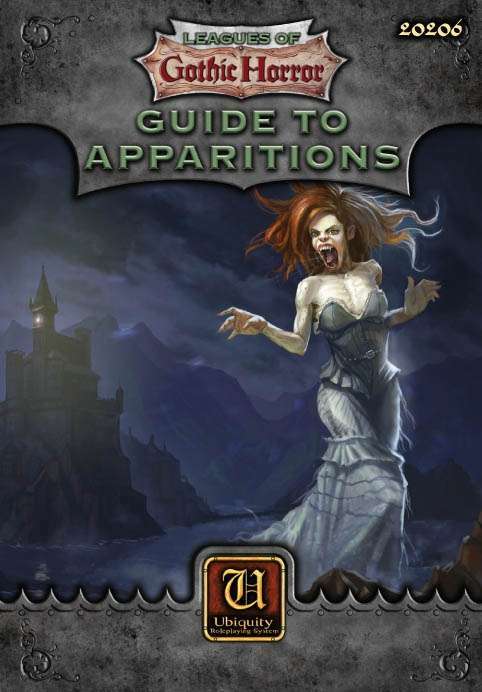 The Guide to Apparitions also introduces how to use the Resources Talent with ghosts, either as a refuge or equipment, rather than as monies. The first is typically set up as a haunted house, but it can be any haunted location and it works well with ghosts who have fetters. The second allows the Game Master to vary the design of his ghosts to keep his players guessing and work as bonuses towards either atmosphere, energy, potency, or strength of a ghost and its haunting. Besides discussing the pros and cons of ghosts’ common powers—invisibility and immateriality—the Guide to Apparitions gives some thirty or so other powers. Some of these it reprints from Leagues of Gothic Horror, the aim being to have one reference point for ghosts rather than the Game Master having to flip through two books to create ghostly NPCs and villains. So, nine of the powers are new, including Corporeal Form, Firestarter, Nausea, Possession, Sickness, and Strangulation. All are very straightforward and really work as you would expect given their names. The contents of the Guide to Apparitions are put into practice in the second half of the supplement with chapters devoted to fiends and villains both ordinary and singular. Most are quite traditional, such as the Banshee, the Hag, and the Will-o’-the-Wisp, but others are quite modern like the Ghost Train and the Miser a la Jacob Marley from Dickens’ A Christmas Carol. A lot have a very primal nature, the Chill, the Famine, the Fright, the Hate, and so on. Some are drawn from non-Western cultures, like the Myling and the Siren, but these are few in number. This is a missed opportunity at the very least, if not an opportunity for the author to write up a book of ghosts from around the world. The villainous ghosts include notorious hauntings, such as the Ghost of Berkeley Square, historical figures like Gilles de Rais, and fictional figures, such as Lady Macbeth and even the Piped Piper. The investigator or ghost hunter is not ignored in all of this. There is advice on how to hunt for and handle ghosts, covering identification, research, categorising and classifying, and protection and destruction. Much of it is common sense, but it works the other way too, allowing the Game Master to set up an adventure with clues and hooks for the ghost hunter to discover and develop. There is also advice for the Game Master on creating and running ghosts and ghost scenarios throughout the book. If there is an issue with the Guide to Apparitions, it is that it is concise. This does not mean that it is missing anything, indeed, the supplement has everything that the Game Master needs to help him run a scenario or three involving ghosts of one flavour or another. Rather it feels as it should have a little more flesh on its bones, perhaps some ghosts from different cultures or some scenario seeds or suggested further reading? Certainly, there are ideas and hooks for the Game Master to mine throughout the book, especially in the ‘Catalog of Fiends’ and ‘Princes of Darkness’ chapters, but nothing specifically written as a scenario seed. As to further reading, perhaps a bibliography or some more real-world cases could have been included for the Game Master to research himself. Physically, the Guide to Apparitions is a decent little book. The artwork is suitably dark and grim, the writing to the point, and the contents a handy guide. There is the feeling though that should have been more in the book, but the Guide to Apparitions has everything to help the Game Master bring the macabre and the ghostly to his Leagues of Gothic Horror campaign.